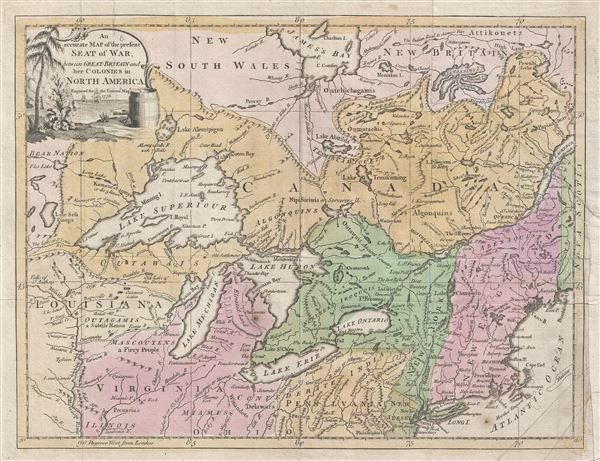 Unusual map of the Great Lakes region at the start of the American Revolutionary War. An accurate Map of the present Seat of War, between Great-Britain and her Colonies in North America. An uncommon and attractive 1776 map of the northern British Colonies (the United States and Canada) at the start of the American Revolutionary War. Published by John Hinton for his Universal Magazine, this map centers on the Great Lakes covering from the Mississippi (Falls of St. Anthony) eastward to Penobscot Bay and the Atlantic Ocean, and from James Bay south to Ohio, Philadelphia, and New York City. The map identifies roads, rivers, forts, cities, American Indian nations, and regional boundaries with topography rendered in profile. The map is presented on an unusual projection that focuses on the northern theater and western theaters of the American Revolutionary War. The real focus here is the Great Lakes, which are beautifully illustrated according to the conventions of the period, with Charlevoix's fictive islands appearing in Lake Superior and a misaligned Lake Michigan. Throughout the surrounding territories American Indian nations predominate with a few trading posts and European forts noted here and there. This is not by chance; control of this region and the important fur trade was one of the major commercial concerns during the war. Moreover, the sprawling Indian territories drive home an often misunderstood point about the American Revolutionary War. Though ostensibly a struggle between colonial and European powers over taxation and representation, a great many of the battles in the Revolutionary War were in fact fought between American Indian allies on both sides for whom the war was not just about rights and wealth, but about sustained existence and cultural survival. Four fictive islands appear just south of the U.S.-Canada border in Lake Superior: Philippeux (here noted I. Royal), Pontchartrain, Maurepas, and St. Anne. These islands were invented half a century earlier by the French historian and traveler Charlevoix, then subsequently immortalized by the cartographer Jacques-Nicholas Bellin. The islands were intended to honor Charlevoix' s personal patron, the Count of Maurepas, Jean-Frederic Phelypeaux. The largest of the three islands, Philippeaux (here identified as I. Royal), is named directly after the count. The second largest island, Pontchartrain, refers to Phelypeaux's family estate. The third island, which may in fact be a mismapping of the factual State Islands, is named after the count's seat, Maurepas. The fourth and smallest of the islands, St. Anne, references the count's patron saint. Charlevoix described the islands as being rich in minerals leading numerous explorers to search for them in vain. Bellin dutifully introduced the four islands to his map, and such was his influence that they were subsequently copied by most subsequent cartographers, including John Mitchell in his seminal 1755 wall map of North America. The highly regarded Mitchell map was used in negotiating the 1783 Treaty of Paris that formally concluded the American Revolutionary War. Therein, the apocryphal Philippeaux was assigned as a marker for the new United States - British America border, as seen here, thus setting the stage for later political strife. It is a matter of curiosity that Kitchin here uses the French names for three of the islands, Pontchartrain, Maurepas, and St. Anne, but renames the largest I. Royal. Today I. Royal stands roughly where Minong is map here. This map was published by John Hinton for the October of 1776 edition of the Universal Magazine of Knowledge and Pleasure. Though no cartographer is named, it is highly likely this map was drawn and engraved by Thomas Kitchin, a known engraver for the Universal Magazine with whose distincitive style this map is consistent. John Hinton (November 13, 1716 - May 11, 1781) was a British bookseller and publisher active in London during the late 18th century. Hinton is best known as the publisher of the Universal Magazine of Knowledge and Pleasure, a popular English periodical issued from 1747 to 1814. The Universal Magazine enjoyed wide appeal and was often lavishly illustrated - for the time - with engravings and maps by such prominent English cartographers as Emanuel Bowen, Thomas Kitchin, and Richard W. Seale. On Hinton's death publication of the Universal Magazine was taken over by his apprentice Stephen Austin Cumberlege. Universal Magazine of Knowledge and Pleasure (J. Hinton) v. 59, Oct. 1776. Good. Some creasing. Older repairs and reinforcement on verso, including repair of large closed tear, from right side, see image. New York Public Library, Map Div. 01-5322. Phillips (America) 586.